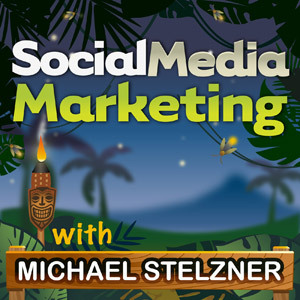 Recently I have been listening to Michael Stelzner’s Social Media Marketing Podcasts via Social Media Examiner and have both learned a lot and enjoyed Michael’s style. He tends towards NOT over-complicating what businesses should be doing to effectuvely leverage social media platforms for marketing communications (MarComm) and customer relationship marketing (CRM), which I appreciate. The periodic doses of humor Michael injects into his podcasts make them a resource that I continue to use and sometimes listen to more than once. More and more I am finding that there are great resources for sparking innovation within the auto industry that are available from outside of the automotive specific vertical… Learning what works for other retailers and businesses can be a great source of inspiration for those of us who specialize in automotive marketing. To learn about why you need to rethink the dealership showroom sales process in this social age, listen to this interview with Tom Martin for the Social Media Marketing podcast. The Social Media Marketing podcast is a show from Social Media Examiner designed to help busy automotive marketers and dealership owners discover what works with social media marketing. 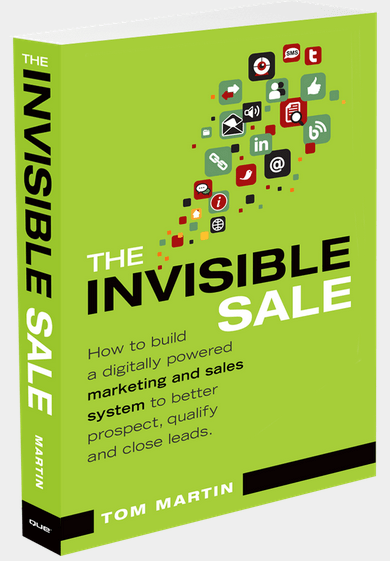 In this episode, listen to an interview with Tom Martin, author of The Invisible Sale: How to Build a Digitally Powered Marketing and Sales System to Better Prospect, Qualify and Close Leads. His agency is Converse Digital. Tom shares the concept of painless prospecting and propinquity. You’ll learn how to succeed in the changing social media sales landscape, and how your business can embrace these new strategies. Tom believes success is more about how buyers buy than the way dealerships and businesses want to sell. With the Internet, people can hide behind the anonymity of Google search. You can do all your pre-purchase research without having to talk to a salesperson. You only have to talk to a person once you’ve made a short list of car dealerships you are interested in and want to test drive the vehicle before closing the deal. Buyers use Google search for pre-purchase research. Today’s buyer prefers this process, as it’s easier and more efficient. With this in mind, companies have to adjust. In the early days, the power was with the salesperson, but with the knowledge available online today, the power is in the hands of the consumer. Tom says as a business, you have to stop thinking about how you sell because you don’t really sell anymore. Instead you help buyers make a buying decision. When they make their decision, hopefully it will be in your favor. Although it won’t always be the case. You’ll discover how your system needs to be set up properly and the approach you need to consider. If you have a really good product or service, more often than not, you will win the conversion. Most people are turned off by people selling to them. The best way is to show them that you’re willing to help and that you always have their best interests at heart. Listen to the show to find out more about how the approach to sales has changed. Tom talks about a camera store called Adorama based in New York that he used as a case study in his book, The Invisible Sale. Adorama only has one store, but does business in all 50 US states and 5 countries. The camera store Adorama is used as a case study in The Invisible Sale. 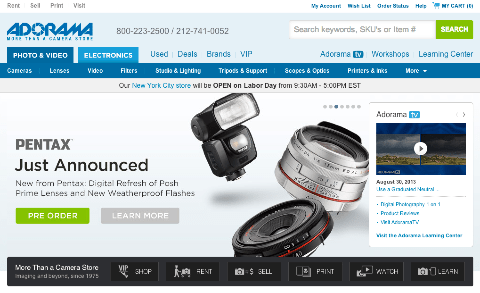 Adorama has two sides to their business, B2C and B2B. Regardless of which side you look at, they approach it the same way. Their philosophy is to sell by sharing original educational content. Even though it’s a photography store, they sell more than just cameras. They’ve built a Learning Center that includes Adorama TV, which is one of their huge content pieces. The Learning Center is a treasure trove of educational content. There is everything from learning how to shoot a photo to discovering the best equipment. Although their approach is to educate, when you watch one of their videos, you’ll notice easy-to-follow links to products below the video. You’ll find out how they used YouTube to allow people to reach that product. 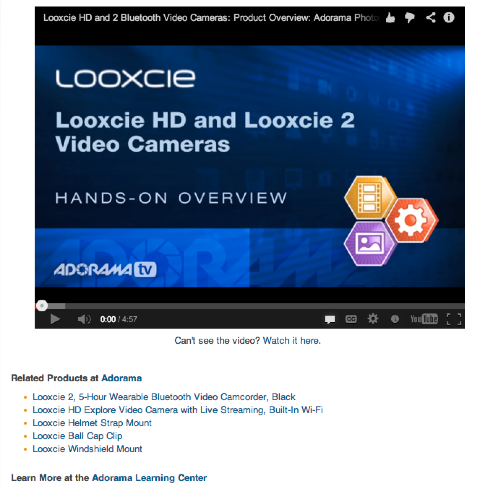 Products mentioned throughout Adorama’s videos are linked for easy access. In 2010, they saw a general growth curve, mainly due to the educational content they provide. The moral of the lesson is that if you can make your buyer smarter and better because they are doing business with you, then Tom believes you will succeed in selling more to that buyer. Listen to the show to hear why Tom relates it to fly-fishing and how it’s the same with modern content marketing. What is a social agent and why is it important? Tom describes a social agent as someone who doesn’t necessarily buy from you, but recommends you to a friend or colleague who might buy from you. A lot of the time, social agents can be your most valuable customers that you never do business with. They’re the best customers you’ll have. You need to draw in your social agents through educational pieces. A relationship is formed with your brand or company when they see value in what you are doing. You’ll learn how Tom became a huge social agent for Adorama. Listen to the show to find out the importance of empowering everyone to be a social agent for your company. In The Invisible Sale, you reveal a process that helps people sell without cold-calling and advertising. Can you explain the process? Tom calls the process “painless prospecting.” The concept is a spin on inbound marketing. The core difference is that most content and inbound strategies leverage search and keyword optimization. As more and more businesses discover and deploy keyword optimization and SEO strategies, Tom believes that only so many will win the battle. It’s going to get more competitive and much more difficult. Whereas painless prospecting is built on the concept of propinquity. Propinquity is a scientific theory that powers the formation of relationships. It says that if you bump into someone a lot, the higher the likelihood of you touching them more often, reading their content or meeting them in person, the more likely you are to like that person, providing you like them each time you meet. You need to build your dealership success on the concept of propinquity. Tom’s painless prospecting philosophy is that you don’t walk away from SEO, but do get off your own blog. You need to think and care more about putting great content on other people’s blogs. Tom advises you to treat every blog as your own. 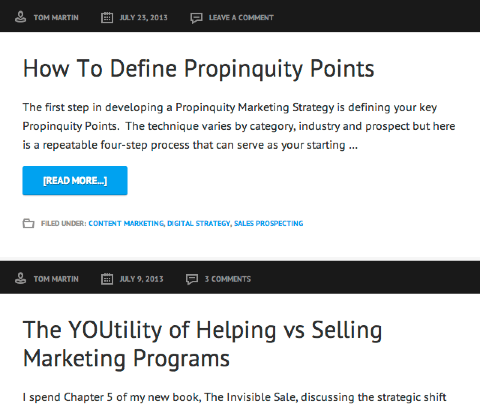 When you put content in these places, they are called Propinquity Points. You’ll learn how to develop a strategy for this to make sure you stay top of mind. Tom shares a quick overview of where you can find places to provide content, but there is a whole chapter (Building a Painless Prospecting Platform) in his book where the process is laid out. Check out the chapter on Building a Painless Prospecting Platform. If you pay attention to what is written by auto industry experts or your OEM you can usually sit down and list all the places that your prospective customers congregate online and offline. You’ll learn where these places might be. If you know the auto industry well enough, you will already know of 7-10 places without thinking. This is your first list. You’ll discover how social listening software such as Radian6 or Sysomos can be beneficial to finding propinquity points for you. Sysomos can help you find propinquity points for your business. Once you find these points, you can create more opportunities for people to stumble across you and your brand. It’s a great way to get a good positive impression. When you get off your own blog, your buyer doesn’t have to be in active research mode to stumble upon you. They might then click through to your blog and possibly sign up to read it. You’ll learn what can happen if you only stay on your own blog. You could have people sign up to your blog who weren’t in active research mode. You’ll discover why you do your best content work when you write for someone else. Tom advises you to write 4 or 5 posts for other blogs, staged over a 2-week period and keep an eye on your Google Analytics to see what happens. You’ll notice that you drive more traffic back to your site. The more you write for these larger audiences, the bigger your chance of people coming over to your site to check out your content. For every 100 people who read your content somewhere else, around 5% will convert to signups. 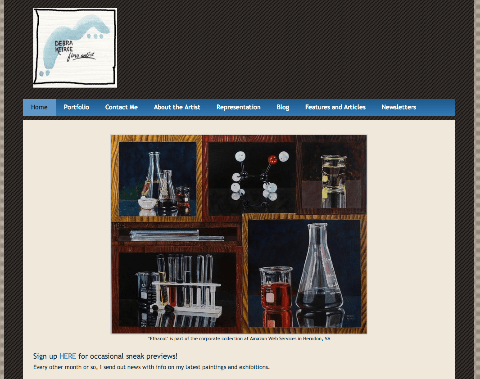 This is how to build propinquity at a blog base. Tom is convinced that the way to win today is to get out there and treat yourself like a media empire. Listen to the show to learn about the invisible component in Tom’s book title. Tom says there are two things automotive marketers should avoid. Most dealership marketing managers produce content at the wrong level. It’s normally the same single unit of content across their blog and podcast. So most feel that one blog post a week is enough without writing for others. 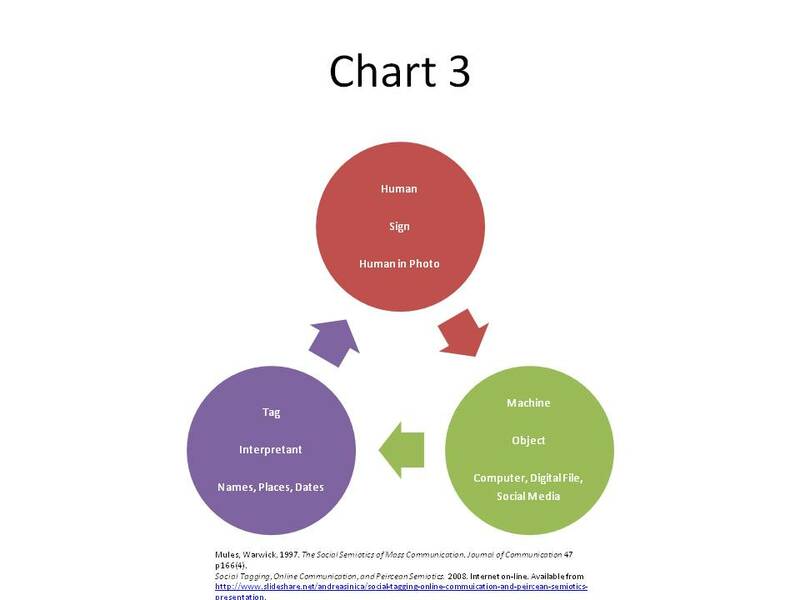 First you have to think about content creation as an ecosystem. You should never create one piece of content once. You should look for ways to repurpose it or even rechannel it. Make sure you repurpose your blog content. You’ll learn about the ways you can turn one piece of content into more content. Secondly, Tom states that there is a belief, especially among inbounders, that every piece of content needs to have a call to action. Although research proves calls to action get more conversions, Tom doesn’t really believe it. He feels there is still value in pure education. You need to go out and educate your buyer. Don’t ask or expect anything in return. Tom states that most buyers know how to buy; you shouldn’t need to rely on a call to action for them to have enough confidence to contact you. Listen to the show to find out why your content should always be of value. “As an artist, sometimes it will take years between contacting potential collectors and receiving a commission or a purchase. Are there specific social media tools that can be used to help develop, encourage and maintain these long-term relationships, so that the leads don’t go cold and people will recommend you to their friends, when at times they are not necessarily looking to buy themselves?” — DebKArt. This is a great question on how to keep top of mind with prospects who aren’t ready to buy. The first thing I would recommend is to make sure you listen to this particular podcast for some great ideas. Here are a few examples of what you could do with your business. When you put yourself in the position of the resource person rather than the salesperson, every time you communicate with prospects, it’s a way to stay top of mind. If, and when, they are ready to buy, they are more likely to come back to you or pass your details on to another prospect. You need to have regular touch points. You’ll hear an example of what I received from people in the voice talent industry when I was a prospect and how my realtor markets his business using social media. I hope you find this helpful. Listen to the show to learn more and let us know how this works for you. Social Media Success Summit 2013 is a special online conference designed to help you master social media marketing (brought to you by Social Media Examiner). Fully online. Click here to learn more. We’ve got some incredible brands that will share what they do with social media. This is just a sample. There is an enormous amount of how-to content. It’s an online conference, which means you don’t need to travel anywhere. It’s spread over an entire month and it’s live. If you want to learn more about it, be sure to check it out. If you enjoyed this episode of the Social Media Marketing podcast, please head over to iTunes, leave a rating, write a review and subscribe. What do you think? What are your thoughts on car dealers selling new and used vehicles, parts, accessories and service with social media? 10 Reasons Why Car Dealers Need to Be In Vegas at AutoCon in September! 10 Reasons Why You Need to Be In Vegas at AutoCon in September! 10 Reasons Why Your Dealership Needs to Send its Management Team to Las Vegas for AutoCon 2013 in September! As I speak with my dealer friends on a daily basis, I know that now is the time when they are evaluating and deciding which Fall Conferences to attend this year. So, I wanted to make the decision easy and provide everyone with the top ten reasons why you need to be at AutoCon on September 4th, 5th and 6th. 1) Hosted a the five star and beautiful ARIA Resort & Casino and rooms are only $125 PER NIGHT! 3) Actionable items to take back and implement at the dealership. We don’t allow our attendees to leave asking themselves “Where do I begin with all this information?” WE MAKE ACTION PLANS! 4) Over 40 top industry thought leaders presenting educational workshops- NO SELLING! 5) OEM keynote presentation and series of Dealer Panel Discussions for YOU to Participate in! 7) DEALER PRINCIPALS ARE COMPLIMENTARY! 8) Intimate atmosphere and ideal networking setting. YOU MAKE RELATIONSHIPS NOT JUST BUSINESS TRANSACTIONS! 9) Highly engaging workshops with rich content that help you stay ahead of your local competition, and SELL MORE CARS! 10) DEALER NETWORKING ROUNDTABLES held each day, which allow you to have one-on-one time with industry professionals on particular topics of interest (Mobile, SEO, BDC, Reputation Management, and more). Now is the time to act while the Early Bird rate is going on through July 4th. Registration rates will only go up after that time, so don’t wait! Make sure you share these ten reasons with your team, and use them to help convince your boss to give you the “stamp of approval” to book your trip! via 10 Reasons Why You Need to Be In Vegas at AutoCon in September! – Automotive Digital Marketing Professional Community. American automotive consumers aged 18-64 who use social networks say they spend an average of 3.2 hours per day doing so, according to new research released by Ipsos Open Thinking Exchange (OTX). Factoring in survey respondents who don’t use social networks, the survey finds that the average online American Car Buyer spends 2 hours a day social networking from a computer, tablet and/or mobile phone. Unsurprisingly, American Car Buyers who are social networkers aged 18-34 self-report spending more time than their older counterparts, and women outpace men in consumption, also. In terms of the gender difference, female social networkers spend almost 40% more time daily with social media sites than men (3.6 hours vs. 2.6 hours), a finding consistent with earlier research from MyLife and from Burst Media showing women to be more active than men on social media. Unemployed social networkers spending 3.5 hours a day on social media, versus 3 hours for the employed. The study breaks down actual hourly estimates per day, with some striking results. For example, roughly 1 in 5 users aged 18-34 claim to spend 6 hours or more per day social networking. Social Media Marketing is playing a major force in how Content Marketing is being shaped. Being able to listen in on conversations is a great way to stay ahead of the curve. Social Listening is just that, it allows you to see fill in the, “Content Gaps”. 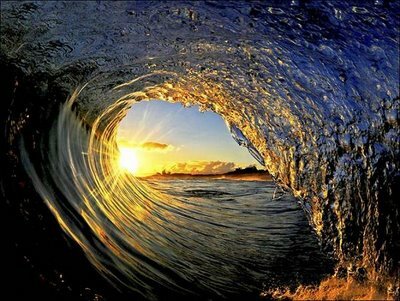 By thinking about where you’ve been the next logical step is to think about where you will go next. Deciding the next 12 months content road map is a difficult process. As you envision where your company will be in the next year, you can think of the content marketing calendar as your guide – a month to month breakdown of what your online marketing and offline collateral efforts will consist of. Is your staff properly trained in conveying your brands’ message? Gather a group of your employees in a meeting room and meet with for a purpose. Depending on how big your company is you will have different teammates from different sectors. 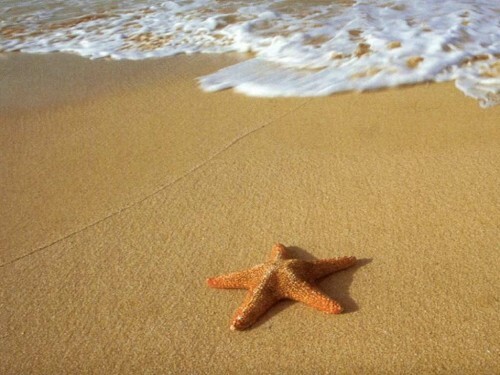 For our purpose we will talk about a small business – owner, manager, creative, etc. – anyone you think of value who would add insight into how you could best build content for your business. Maybe your accountant or your janitor. The Idea Brainstorm, is a perspective that will not only create a spark but will give you the opportunity to see it from their view, from their – “Panoramic Point of View” – you not only see it from their shoes, but also see through their eyes. This Idea Brainstorm not only gives you ideas from which to pull content from but but also an opportunity to hear what your employees are saying. There are times when a group gets together and becomes energetic. This energy sometimes produces ideas that generate millions of dollars. What’s great about your Automated Social Marketing, is that you can schedule what information you want posted on what day and on what page. Get on the Google+ bandwagon before it becomes a bandwagon – In 2011, I said that Google+ had potential. In 2012, it started showing signs of having influence over searches, placement of reviews in the local section, and an increased engagement level on the social networking component itself. In 2013, it will go from an option to a “must have”. We saw this sort of necessity budding with Facebook in 2008 and Twitter in 2009. Google+ is different because it’s accelerating faster than any of its predecessors. Get going now or you may fall terribly behind. Make quality content the highest goal for website improvement – We’ve discussed it several times over the last few months and we’ll continue to discuss it for as long as it remains important. High-quality content is the key to both search and social more than it has even been in the past. Unique, important, entertaining, and informational content that can get the inbound links and social shares to your website can be your secret weapon in 2013. Consolidate your social media posting strategies – This is a challenging one to discuss and deserves its own blog post in the near future. There’s a difference between posting the exact same content to all of your social profiles and pages at the same time and consolidating the strategies in a way that will make the whole greater than the sum of its parts. It’s not that you will cross-post everything you have. It’s that you’ll want to make sure that everything from website content to Facebook posts to Pinterest pins are pointing in the same strategic direction. Get visual – The written word is harder to promote than the visual message. All of the major social networks love images. Most hate links. That doesn’t mean that you can’t try to make links a part of the message, but all too often it’s the only part. This has to change in 2013. Post higher quality instead of more often – If given the choice between crafting and promoting a single piece of content on Facebook and Google+ that truly resonates with the communities or posting a lot of good but not great content, I’ll take the former every time. Your posts have to pop or they’ll go nowhere. Grow your targeted following ONLY – There was a time when it was okay to get a boost on followers by targeting the whole world. It’s easier to get local followers to a big account than one that is tiny. Things have changed, though, and now it can actually damage the effectiveness of your accounts by being too large with untargeted followers. Tighten it up, prune when necessary, and stop trying to inflate your numbers. Build a true personality with your social profiles and stick with it – This is not a call to become the cat-picture poster of Facebook. There are plenty of those. It’s a call for businesses to personalize, to make sure that there is humanity within their social media posts. It could be regular promotions of a local charity, funny videos made by the business that can quickly become “a thing”, or just staying business-focused but with a real person expressing real ideas and offering real advice in their industry. It’s hard to limit this list to 7. I actually had to cut off three of the tips I was going to give because they were too hard to try to fit into a list; they deserve individual blog posts of their own.There are so many other things that businesses should do in 2013 to make their social media shine like never before, but it’s better to start with a handful of achievable goals rather than be flustered by the failure of taking on too much at once. If you do these things, you’ll get better this year.Thankfully, nothing on the list is that hard. Twitter Cards Make Video Marketing Easy as 1-2-3 Tweet! When marketers think of social media as a promotional channel, Facebook continues to be the network of choice. Of course, this trend may be the result of people sticking to a platform that feels safe. After all, Facebook remains the largest and most influential social platform on the web today, so much so that it claimed the most-searched term award for the fourth year in a row. But other social networks shouldn’t be ignored, especially with sites like Twitter implementing new features regularly. According to eMarketer’s “US Digital Media Usage: A Snapshot of 2013,” Twitter user-ship grew significantly in 2012, but only 15 percent of the U.S. online population will engage on Twitter next year. Therefore, brands that want to drive traffic from a variety of social channels must learn how to engage users on whatever network they prefer. For many people, Twitter remains the most influential social hub, and brands may discover that video content thrives on this platform. According to the source, Twitter’s user base increased by 14.2 percent in 2012 to reach 36.3 million monthly active members. To reach those prospective and current customers, brands must develop social media marketing campaigns that make branded content enjoyable and simple. 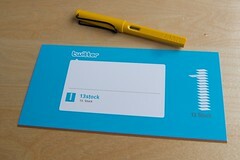 With Twitter Cards, video marketing may be the easy solution. According to eMarketer, online view viewers reached 178.7 million people in 2012 to make up 56 percent of the nation’s population, and 73 percent of American internet users. As for mobile video viewers, 73.3 million people watched video content via their mobile devices in 2012, reaching 22.9 percent of the country’s population and 29.6 percent of mobile phone users. Thirty-one percent of the U.S. population and 40.4 percent of U.S. internet users viewed visual media from their tablet devices this year, making video content marketing a necessary practice for many brands. With Americans using Twitter more often this year and video media becoming a prominent marketing material, businesses that want to build brand exposure and grab consumers’ attention must produce consistent visual content, and publish output on the microblogging site. Together, video marketing and social media marketing may drive higher conversions in the new year, and help marketers reach new audience segments online.